The principle of human equality is a testimony that Friends are both proud of and challenged by. Proclaiming the importance of equality among peoples is far easier than living equality, day to day and interpersonally. 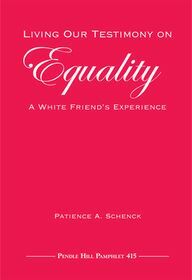 Pat Schenck has dedicated years of study, self-examination, and experimentation to living racial equality in a society that still supports inequality in its institutions. Writing openly and personally about her successes, failures, and discoveries, she shares her stories and offers wisdom to white Friends, in particular, who wish to create more diverse, welcoming, and fully supportive communities of all races in our meetings and in our lives. Discussion questions included. Patience A. Schenck has made her spiritual home at Annapolis (Maryland) Friends Meeting since 1966. In 2000, shortly after retiring from paid work, she experienced a call to focus on anti-racism work. In 2002 she founded the Baltimore Yearly Meeting Working Group on Racism and served as clerk for its first five years. She has led workshops on racism in her monthly and yearly meetings, at Friends General Conference Gatherings, and in her community. She serves on the Annapolis Human Relations Commission. Pat grew up in Illinois, graduated from St. John’s College in Annapolis, and earned a master’s degree in education from the University of Chicago. She has two children and three grandchildren who give her much pleasure. She is retired from elementary school teaching and administration of a continuing education program for physicians. She feels much enriched by the enlarged perspective she has gained by examining her white identity and learning about how people of other identities see the world. Pat can be reached at pat.schenck@verizon.net.